Filter by Account Format Standard Legend Ed. The new season of the legendary PES franchise, PRO EVOLUTION SOCCER 2019, is approaching. Remember that this product is exclusive to PS4 and can be in digital format, which can have regional blocking, or in physical format. Don't forget to read the digital version specifications carefully to see if you can activate it from your region. The most popular PES mode also suffers a lot of improvements. myClub mode, the game mode that allows us to buy players and managers through in-game GPs or microtransactions to create the team of our dreams, will now include important new features that will increase the fun of this mode. PES 2019 also includes real leagues, which is a huge addition of licensed leagues. Players now have 11 new skill features that will make each player unique on the field. Improvements in the movement of shooting and animation, and the introduction of resistance and its visible impacts on players when it is reduced. 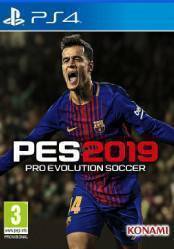 There are no comments yet about PRO EVOLUTION SOCCER 2019 - PES 2019. You can be the first one!